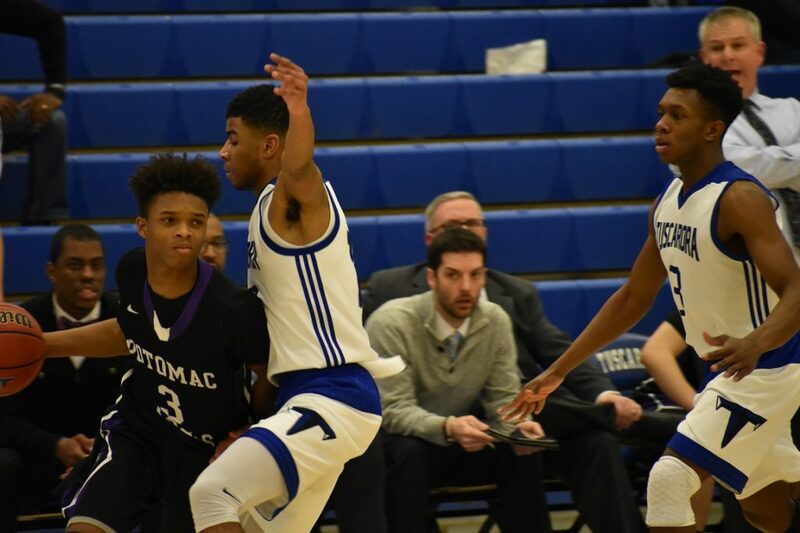 Junior guard Chandler Tuten scored 23 points and senior forward Henry Okoye added a double-double as host Tuscarora stopped Potomac Falls 74-63 in a Potomac District battle Tuesday night. Tuscarora (4-3, 9-6) was up ten at halftime but it got close in a hurry to start the third quarter. The Panthers were cold from the perimeter virtually the entire game but embarked on a 13-2 run to start the second half, forcing turnovers and getting to the rim instead of settling for quick threes. But after a time out from Tusky coach Al Smith, guard Sammy Fellah found Tuten open for a three-pointer. Tuscarora regained the lead and battled Potomac Falls to a tie game after three. The Panthers’ Brett Asbury handles the ball against Tusky’s Jared Cross and Alex Bailey. Things started to loosen up on offense for the Huskies in the fourth. Tuten had been the Huskies’ most consistent scoring threat but he started to get more help. Wings LeRon West and Michael Healy hit from outside and guard Jared Cross (11 points) started to get to the line. The Huskies defense again started to make the Panthers take ill-advised perimeter shots and the 6’5″ Okoye (12 points, 11 rebounds) was there more often than naught to rebound their misses. 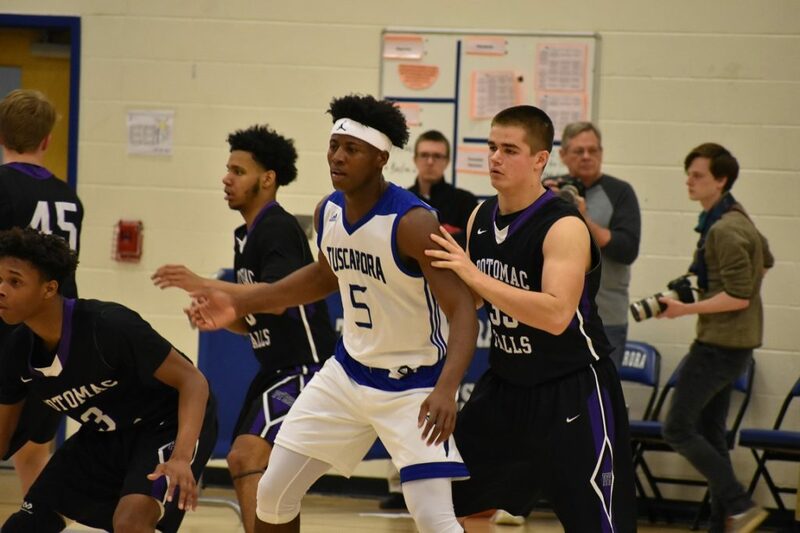 Tuscarora senior forward Henry Okoye establishes himself in the lane. Okoye had a double-double. Tuten essentially sealed the victory with a the last of his five three-pointers with under two minutes left to put his team up 63-56. He was efficient from outside, in stark contrast to virtually everyone else on the court from three-point range. Tuten was 5-9 from the arc on the evening while the Panthers were an ice-cold 3-25 as a team. That was the difference in the game. 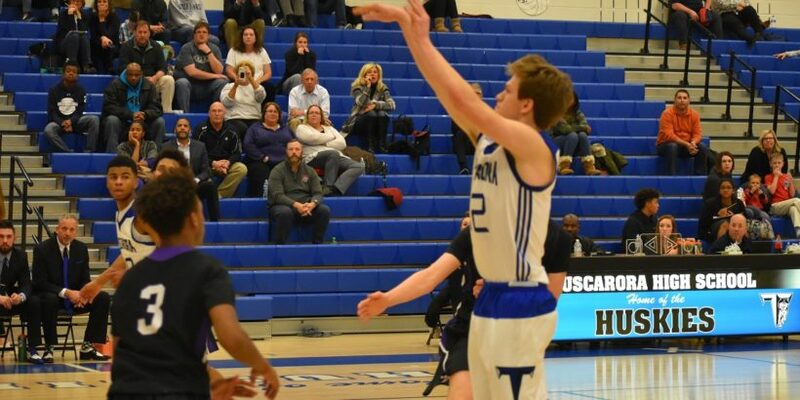 For Potomac Falls (4-3, 10-4) talented junior forward Ian Anderson led the way with 16 points and 11 rebounds. Junior guard Brett Asbury added 13 points, while senior Sterling Anthony and sophomore Landon Hawes each had 12 points and eight rebounds. The teams will battle again the last game of the regular season, and you get bet the Panthers will make sure they’re a little more aware of Tuten next time around.